"Bringing Clean Air to You"
Look for links to printable pdf literature in equipment specifications sections, above in this column, & on site map. Ideal for petroleum, synthetic, and water soluble machining fluids. The new MistBuster® 500 is a self-contained mist removal system designed to capture mist and smoke from metal working applications in industry. The MistBuster® can be direct mounted to machine tools or ducted using optional plenums and flex hose. 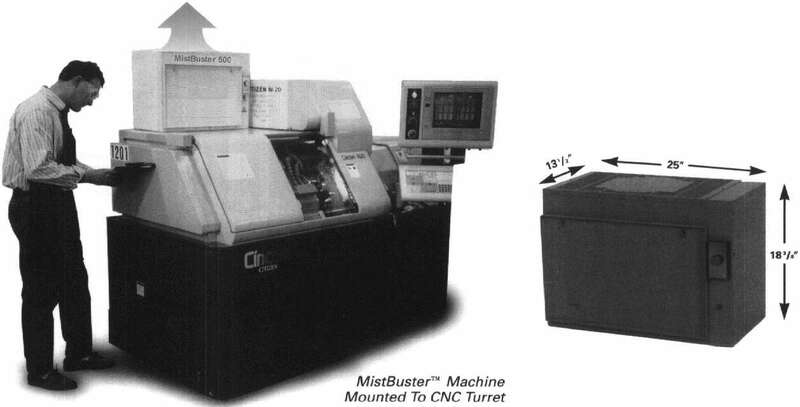 The MistBuster is the superior alternative to conventional centrifugal and media-type systems. MistBuster 500 works best on enclosed machine tool applications where the open area is no more than 3-4 sqft and coolant pressures are below 1000 psi. For pressures above 1000 psi we suggest using our MistBuster 850. Over 1200-1500 psi use MistBuster 2000. If you are machining cast iron, please consider our MistBuster Infinity. Clean Air — Eliminates the haze associated with most metal working operations. Health — Reduces exposure to machining fluid mist which has been associated with respiratory disorders and skin ailments. Safety — Reduces the risk of accidents caused by slippery surfaces. Machine Fluid Savings — The MistBuster® collector collects and returns the machine fluid to your machine rather than venting it to the atmosphere. Cleaning Cost Savings — Uncontrolled machine fluid mist will soil machinery, floors and ceilings. High Efficiency Mist and Smoke Removal -Independent laboratory tests confirm up to 97% efficiency. Low Operating Costs —The MistBuster® requires less than 230 watts of power to operate. Low Maintenance Costs — The MistBuster 500 has no costly media filters to replace. 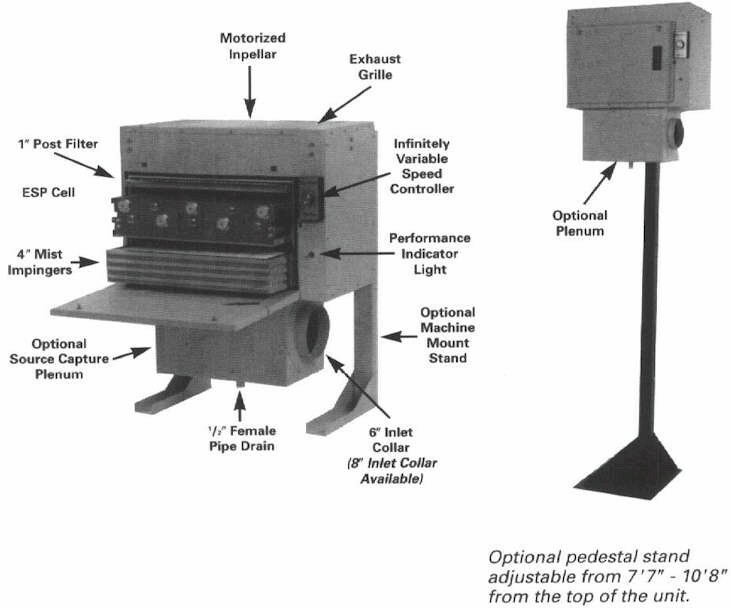 Easy Installation — The MistBuster can be mounted directly to the machine tool, pedestal, wall or ceiling. Polluted air is drawn through the first stage mechanical mist impingers. These impingers are designed to remove the larger mist droplets and particles. The remaining sub-micron mist droplets and particles are removed in the second stage through the process of electrostatic precipitation (ESP). The ESP provides an intense electrical charge on the remaining contaminants through the ionizing field. The collection cell, which works much like a magnet, attracts and removes the charged mist droplets from the air stream. To optimize efficiency, an aluminum post-filter entraps particles, which may have been agglomerated on the cell plates. Clean air is then returned to the room. Motor starter and control circuitry. Infinitely variable motor speed controller. Final stage, absolute HEPA postfilter. Optional remote variable speed controller. INLET OPENING: 16.62" x 9.08"
FILTRATION: 1st Stage 4"thick aluminum mist impingers. POWER SUPPLY: Self-regulating, dual voltage solid-state power supply. MOTORIZED IMPELLER: Backward curved, vibration-free, direct drive rated at 710 cfm @ 0" wg. POWER CORD: Ten-foot power cord with standard molded plug. Worldwide Supplier of Air Purifiers, Air Cleaners, Air Filters, Dust Collectors, & Mist Collectors shipping from North America. Many, but not all models are displayed. Air Purifiers are available with a variety of electrical options to meet the power standards of most countries. Last modified: 01/05/2014 Send mail to WEBMASTER@berriman-usa.com with questions or comments about this web site.